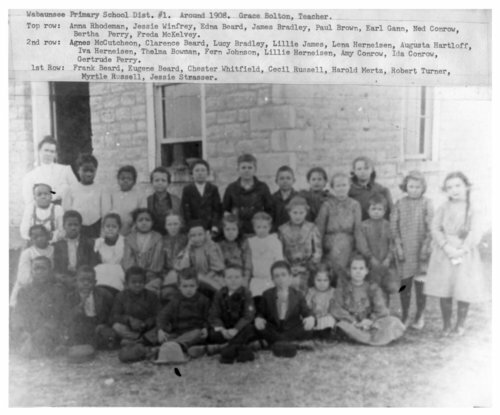 Photograph of students at the primary school for District No. 1 in Wabaunsee County, Kansas. The teacher, Grace Bolton, is standing behind the students on the far left of the photograph. Students have been identified as (top row, left to right) Anna Rhodeman, Jessie Winfrey, Edna Beard, James Bradley, Paul Brown, Earl Gann, Ned Conrow, Bertha Perry, and Freda McKelvey; (second row, left to right) Agnes McCutcheon, Clarence Beard, Lucy Bradley, Lillie James, Lena Herneisen, Augusta Hartloff, Iva Herneisen, Thelma Bowman, Fern Johnson, Lillie Herneisen, Amy Conrow, Ida Conrow, and Gertrude Perry; (first row, left to right) Frank Beard, Eugene Beard, Chester Whitfield, Cecil Russell, Harold Mertz, Robert Turner, Myrtle Russell, and Jessie Strasser.